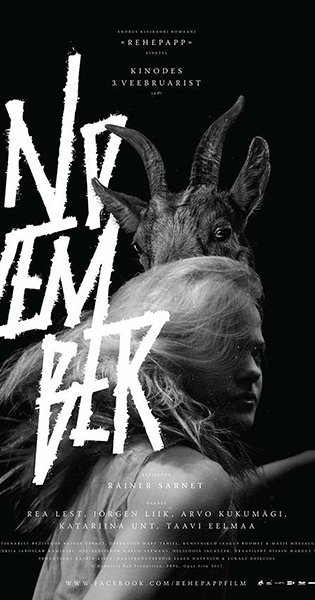 'November' is based on Estonian novel "Rehepapp" by Andrus Kivirähk, a bestseller of the last twenty years. The film is a mixture of magic, black humor and romantic love. The story is set in a pagan Estonian village where werewolves, the plague, and spirits roam. The villagers' main problem is how to survive the cold, dark winter. And, to that aim, nothing is taboo. People steal from each other, from their German manor lords, and from spirits, the devil, and Christ. To guard their souls, they'll give them away to thieving creatures made of wood and metal called kratts, who help their masters by stealing more. They steal even if their barns are already overflowing. Stealing is an obsession that makes the villagers more and more like the soulless creatures they command, the kratts. The main character of the film is a young farm girl named Liina who is hopelessly and forlornly in love with a village boy named Hans. Her longing makes the girl become a werewolf and jump into an ice-cold pond. She's ready to die in the name of love. The pragmatic farmers are faced with a question: is the life that they've won through so much toil worth anything, if it lacks a soul? Estonian pagan and European Christian mythologies come together in this film. Both mythologies look for a miracle; for an ancient force that gives one a soul. This film is about souls - longing for a soul, selling your soul, and living without a soul.